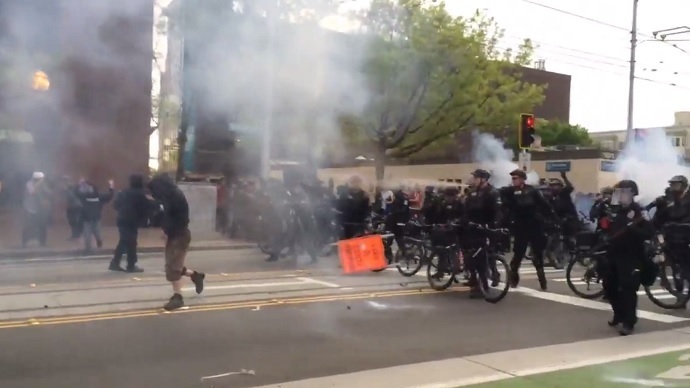 Protesters at a May Day march in Seattle, Washington clashed with police during what law enforcement called "a riot" on Friday. Officers deployed flashbangs and pepper spray to try and get the crowd under control. Hundreds of demonstrators took to the streets Friday to participate in pro-worker, anti-police-brutality rallies, as well as one that was billed as anti-capitalist. According to the Seattle Times, one protester broke a window and others threw rocks at police before law enforcement responded with flash bangs. "As we continue to witness acts of violence from protesters, we urge folks on Capitol Hill to exercise caution," said Mayor Ed Murray in a statement. "Seattle Police are advising that businesses on Broadway and other Capitol Hill streets should take reasonable precautions to protect their employees and customers. Police will continue to work to protect people and property in the area, and will make arrests when necessary." Three officers have been injured at the scene of a melee at Broadway and Howell, the Seattle Police Department tweeted, two of which were hurt seriously. A total of fifteen people have been arrested across the city, police said. One protester has reportedly thrown a burning object into a vehicle. Police said fires have been ignited at Seattle Plaza and that 25 vehicles have been damaged. Police tweeted that an "explosive device" was thrown at officers and said the situation has escalated into a riot. Meanwhile, video surfaced of individuals breaking windows as they made their way through the city. The Seattle Times reported that earlier in the day, a Black Lives Matter march planned to meet up with the May Day March for Workers and Immigrants Rights. Earlier in the day, police said they were concerned about a third group of self-proclaimed anarchists who might try to cause chaos in the city. In this video, some of the masked protesters can be seen marching and chanting. For most of the day, the marches were peaceful even though protesters disrupted traffic at times. When confrontation first broke out between police and protesters, officers were reportedly hit with flags and sticks. Seattle Police Captain Chris Fowler explained the situation to a reporter on the ground. Amid the chaos, some helped clean up what others made a mess of.